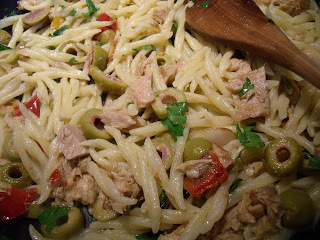 what's cooking in my tuscan kitchen: Pasta with tuna, version 2 - a great recipe to make during lent! Pasta with tuna, version 2 - a great recipe to make during lent! Today I was so intent on my translating that I lost track of time and before I knew... it was time for lunch and I didn't have the slightest idea as to what to cook! Tuna salad? Tuna melt? 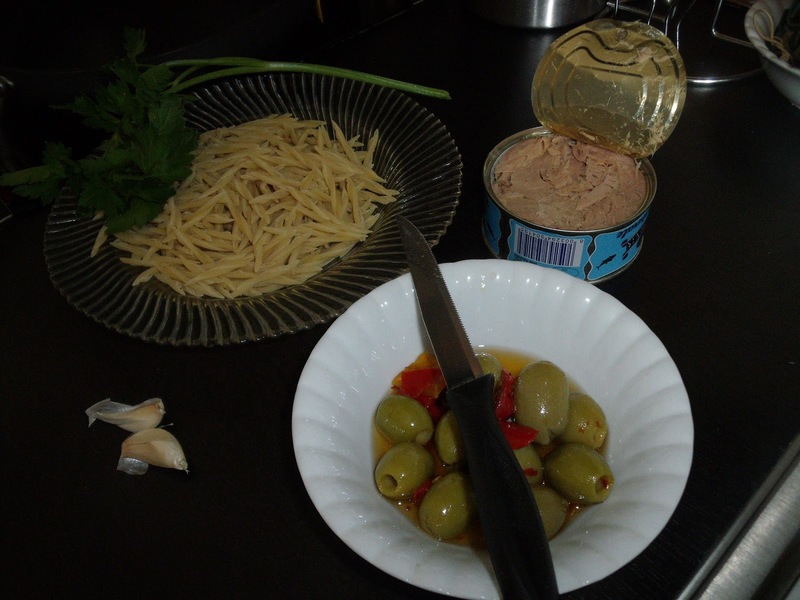 We were famished and I had no desire to chop celery, onions, add mayo, toast the bread, make the sandwich, broil it to make the tuna melt.....so I ended up making a really quick version of my Pasta with tuna and olives recipe! 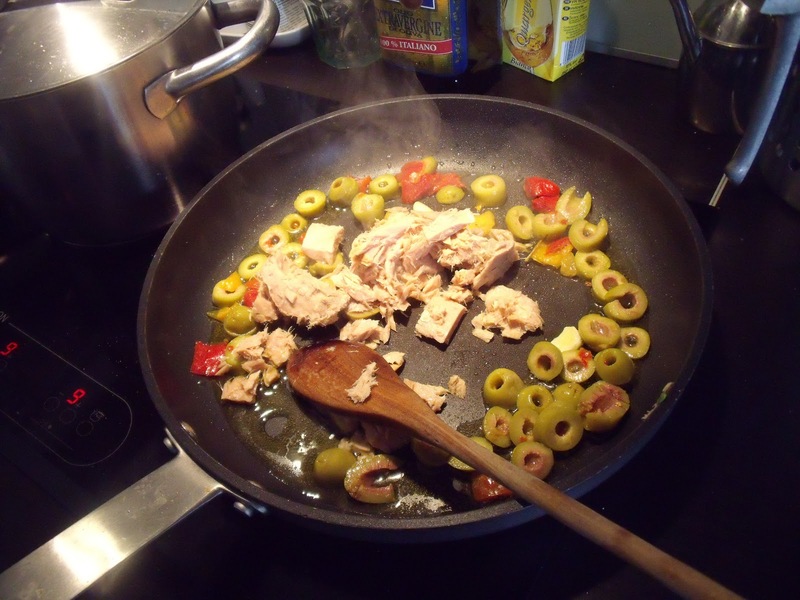 Sauté the olives and garlic for a minute or two, add the tuna and flake it with a wooden spoon or fork. Cook for a couple of minutes. Add the chopped parsley, I also added a splash of white wine. In my book, white wine makes almost any dish better! Remove from heat. As soon as the water comes to a boil, salt it and put the pasta in to cook.While the pasta is cooking, grate some Parmesan cheese. 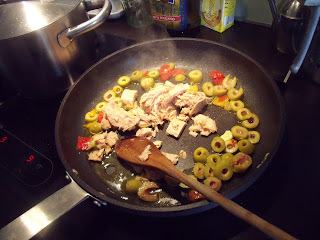 When the pasta is "al dente", drain and add it to the tuna and olives. Turn the heat up to high. 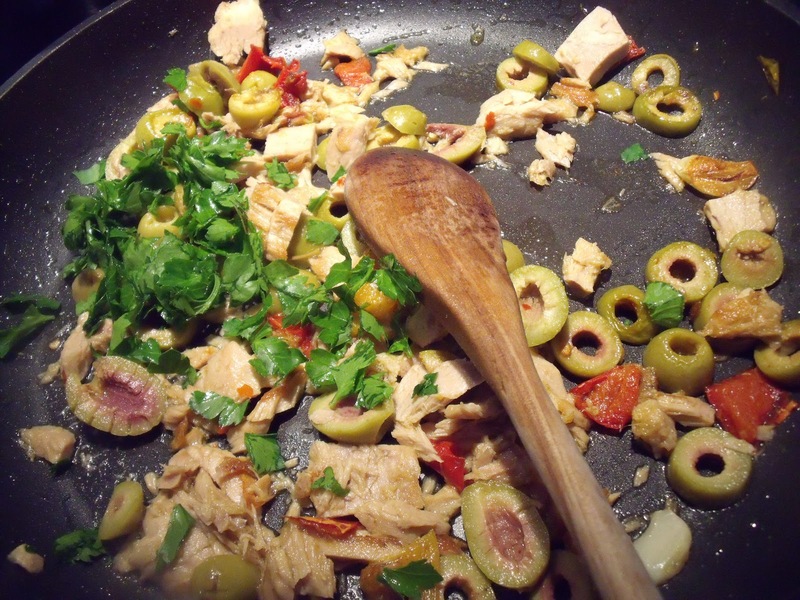 Toss the pasta with the tuna and olives for a minute or two. Serve with grated cheese or hot pepper. Note that I did not add any salt to the olives and tuna... they are salty enough!! I made this and it was exquisite! Next time I am making double.